Earlier in August, the San Francisco startup secured a giant $100 million investment from several investors. 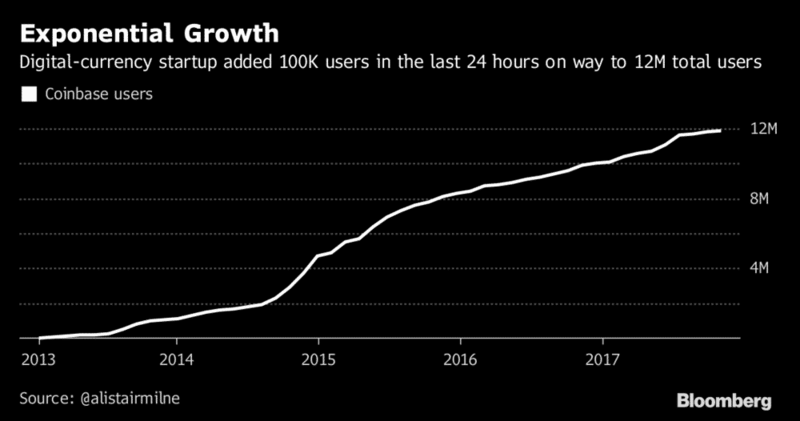 Digital currency exchange Coinbase has added 100,000 users in just 24 hours, continuing a record spurt lasting since CME Group announced plans to launch Bitcoin futures in the fourth quarter of this year. According to a Bloomberg report, the latest statistics are based on data collected by entrepreneur Alistair Milne, a portfolio manager at the Altana Digital Currency Fund, who analysed archived website data to reveal the impressive total which runs through early November. According to the chart below, Coinbase has surpassed 12.0 million registered users. During 2017, the cryptocurrency exchange added an astonishing two million users as the price soared to peak above $7,000. Bitcoin printed fresh record highs in the last two days after the futures exchange operator CME announced plans to launch cryptocurrency futures, a strong sign of the growing prominence of Bitcoin in mainstream financial circles. Facing challenges on several fronts, the US CFTC is investigating the performance of Coinbase’s institutional exchange platform GDAX over the June 21st Ethereum flash crash. Earlier in August, the San Francisco startup secured a giant $100 million investment from several investors, giving the company a valuation of $1 billion and making it first ‘Bitcoin unicorn’. Join us at FM London Summit to discuss the online FX industry. Learn more about the agenda of Europe’s largest FX industry event. A dedicated panel will provide much needed clarity about the various applications of cryptocurrency for financial services, discussing industry visions a well as products, security, and risk management.